Why are pupils from disadvantaged families more often found studying in poorly performing schools? Why are pupils from disadvantaged families more often found studying in poorly performing schools? Is it choice or is it constraint? Is it because the families choose local schools despite low performance? Or is it because the school admissions system which focusses on proximity to school works against poorer families? New research from CMPO, IFS and Cambridge shows that differences in constraints in school choice between households of high and low socio-economic status drives the unequal allocation of pupils across schools much more than differences in preferences. Our research looked at the choices of primary schools made on the Local Authority application form for thousands of families in England (using the Millennium Cohort Study). We first show that there are substantial differences in the academic quality of the local schools for families in different socio-economic groups. On average, the richest socio-economic quintile of families have schools nearby that get grades 46% of a standard deviation than those available to families in the poorest fifth of families. On top of that is a second layer of difference. When popular schools have more applicants than places, there has to be some mechanism to ration those places. The most widespread criterion in England is proximity – families living closer to the school are given priority. Our study shows that this adds a substantial further difference to the quality of available schools – the gap in average school quality for the richest and poorest fifth of families is one third greater when considering schools feasible in terms of distance and the probability of admission. It is this criterion that is responsible for a significant component of inequality in access to high-performing schools. 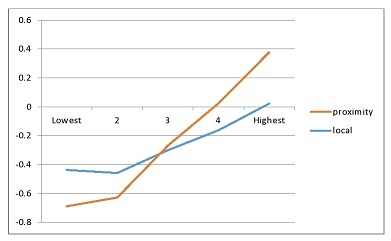 The figure shows the mean school academic quality available to families across the socio-economic spectrum, differentiating between those that are nearby but not necessarily feasible (“local”) and those that are have a high probability of admission once we take account of the proximity rule (“proximity”). Of course it could still be true that differences in preferences are much more important than these differences in available choices. But our analysis shows that this is not the case. Different families have different sets of schools to choose from: richer families choose between schools that on average have higher performance than poorer families. The differences in school choices made between households with higher and lower socio-economic status therefore largely reflects differences in the available schools. Our research related families’ choices of school to the attributes of all local and feasible schools to estimate the strength of the families’ preferences for these attributes. We also investigated the variation in observed preferences between socio-economic groups. Our results show that families care about three main school attributes: the academic quality of the school, its socio-economic composition, and the home-school distance. The majority of households prefer schools with higher academic standards. On average, families prefer schools with fewer children living in low-income households. Almost all households have strong preferences for a school near where they live. Preferences differ across socio-economic (SES) groups: those in the lowest SES group in particular have distinct preferences, with a preference for lower academic quality and a higher proportion of pupils from low-income backgrounds, on average. Households from each SES group value proximity to the same extent, however. In summary, households from different SES groups face differences in the type of schools available, but also have different preferences to some extent. Both factors may contribute to the unequal presence of pupils from different SES groups in different schools: we wanted to know which factor was more important. Because of the spatial clustering of our survey data, the majority of our sample share feasible school choice sets with at least one other household. This allows us to control for all the characteristics of the choice sets (technically, to define choice set fixed effects) and therefore to compare the choices of households from different SES groups confronted with exactly the same feasible school choices. This allowed us to decompose the overall relationship between SES and the academic quality of the chosen school into a component due to different preferences and a component due to differences in school quality across feasible choice sets. We show that the constraints account for two thirds of the overall observed difference. These constraints are largely driven by admissions criteria (principally the proximity criterion), which means that choice is restricted for some households. To address these questions we assembled a unique dataset. We used survey information on parents’ primary school choices and a rich set of family socio-economic and neighbourhood characteristics. We linked this to administrative data on the characteristics of schools, and the nature of the local school choice mechanism. To identify parents’ constraints in terms of available school choices, we used the national pupil census with embedded spatial information to model de facto catchment areas around schools within which there is a high probability of admission. The broader implications of our results for choice in education are mixed. Most parents in our data have a strong preference for schools with high academic attainment. This supports the idea that competition to meet these preferences should help to raise the standards in England’s schools. The measure of academic attainment we use is an absolute measure of test scores as this is what parents are most likely to be familiar with, and not an estimate of school effectiveness. How schools try to increase their test scores, either through increasing effectiveness or manipulating their intake of pupils, is therefore another important question in the chain between parental preferences and school effectiveness. Our results confirm parents’ preference for a school near to home. We are confident that this is a true preference and not the result of proximity enabling entry, as all schools in the set we define as having a high probability of admission should be considered feasible by parents. This implies the existence of de facto local monopolies, not through the lack of choice, but through strong preferences for proximity amongst parents of primary school children, perhaps due to transport costs and practical considerations of travel with young children. What can be done? Popular schools cannot take everyone who applies – there has to be some mechanism to ration places. If we want to break the link between access to high-performing schools and family income, then we need an alternative to proximity as a tie-breaker. A lottery for over-subscribed places is one idea used around the world, but only infrequently in England. Schools could set aside a fraction of places for applicants who live beyond the “catchment” area of the school. Alternatively, schools could apply a banding system often used in the past, whereby schools’ intake of pupils is spread across the distribution of prior attainment or socio-economic background. The overall goal for policy is to make all schools excellent. But until that nirvana arrives we cannot ignore the question of how places in the better performing schools are allocated. And at the moment, the proximity criterion for admissions means that differences in family income have a substantial and regressive impact on that allocation.